When using the Windows Look & Feel on a high DPI display, JLabel fonts and other widgets are scaled, so that they look good on the display. 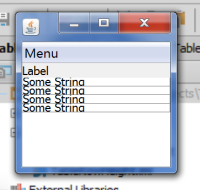 Unfortunately, it seems like the default JTable row height was forgotten. It is still set to 16 pixels, which is (a lot) too small and looks horrible. (btw, when using the standard L&F, no scaling occurs, opening up a great business opportunity for selling magnifying glasses). Run the following class on a machine with high DPI display, using DPI scaling. * Demo table to demonstrate bad row height on HiDPI displays. Using this plain vanilla approach I would expect to see a table with appropriately sized rows. The rows are not high enough. 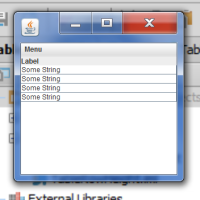 Standard table content appears clipped.